Cable Management Rail Kits are made of multiple pieces of 7 RMU sections of "fingers." When used with ES enclosure, fingers are installed on the front of the rail using Great Lakes' flexible mounting profile, a series of holes outside of the EIA pattern (used for fingers and other accessories). EN rails have more than one series of holes (as pictures), so fingers can be installed on the front, side, or rear of rail. 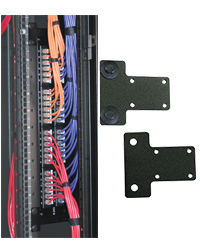 Fingers align with rack mount units on both enclosures creating clean cable pathways. ESC-K12 Cable Management Rail Kit; includes 12 sections of "fingers" (each section, 7 RMU); if used with E and ES enclosures, rails will need to be recessed 4.5"
ENC-K24 Cable Management Rail Kit; includes 24 sections of "fingers" (each section, 7 RMU); if used with E and ES enclosures, rails will need to be recessed 4.5"
CM-47 Single section of 7 RMU "fingers"); if used with E and ES enclosures, rails will need to be recessed 4.5"
CM-10 19" Horizontal Panel with 10 Slots, .250" x 2.00"